Nothing beats grilling in the summer heat. These fresh shrimp tacos use the grill and nothing else — no heating up your oven or stove top, just a quick cook on the grill and you've got dinner! Top juicy shrimp with a spicy, garlicky aioli and serve on soft corn tortillas for a meal that can't be beat. Sprinkle on a little crumbled Mexican cotija cheese and squeeze fresh lime juice over the top for a fresh pop! Serve with a fresh salad, Mexican corn, or rice. Whisk together the garlic powder, paprika, Sriracha, salt, pepper, lime juice, and olive oil in a bowl. Throw in the shrimp and toss until they are completely coated. Grill the shrimp on high heat until cooked through, about 2 minutes per side. You can grill on an indoor griddle if you don't have an outdoor grill, or simply cook the shrimp in a large saute pan. Add the mayonnaise, sour cream, salt, pepper, garlic clove, Sriracha, and lime juice to your blender or food processor. Blend until completely smooth. Taste and adjust the salt and pepper as needed. Toss the dressing with the coleslaw in a large bowl until completely coated. Cover and refrigerate if you aren't using right away. 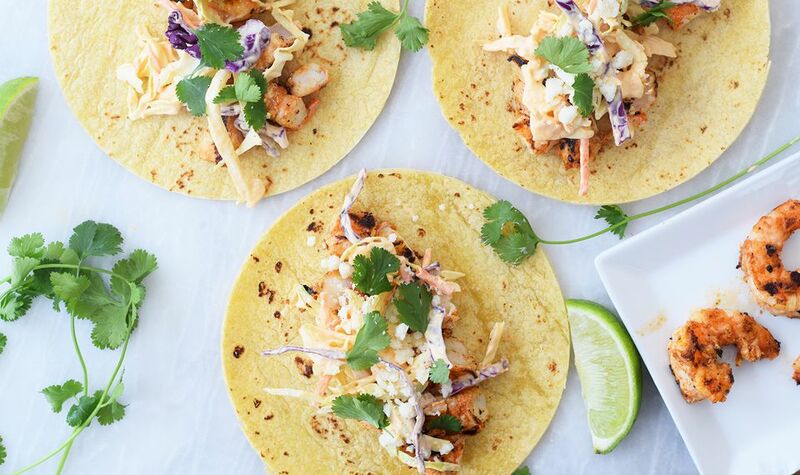 Place the shrimp on top of the tortillas then add the coleslaw, cotija cheese, and cilantro. Then squeeze a little lime juice over the top. Dig in and enjoy! You can totally make your own corn tortillas if you'd like to make this completely homemade. You can also shred your own cabbage. You can choose different colors of cabbage, and mix in shredded carrots, too. Change up the toppings. You can use regular shredded Mexican cheese and add in toppings like avocado, diced tomatoes, or homemade pico de gallo. You can grill the shrimp and make the coleslaw up to a day ahead of time for this dish. The tacos are delicious hot, cold, or room temperature! Heat the tortillas in the microwave, covered with a damp paper towel right before you are ready to serve. This helps the tortillas stay flexible so they don't break when you eat them. Skewer the shrimp before grilling, so they don't fall into the grill! If you are using a grill pan, it's not totally necessary. You can brush on more of the marinade as the shrimp cook.